Let’s face it, the American diet is terrible. Rarely do any of us eat enough fresh fruits and vegetables; instead, we reach for what’s quick and easy—packaged food and fast food—which have been so over-processed that their nutrients have long been destroyed. The reality is, we’re running our bodies on empty. And like a car, we need fuel to go. Good fuel. Not empty-calorie junk. When you start thinking of food as fuel, you immediately realize how important Shakeology is in your daily diet. Because Shakeology is packed with the world’s most potent, nutritious, and delicious ingredients, it’s the quickest and easiest way to eat healthy, stay satisfied, and live a healthy life. 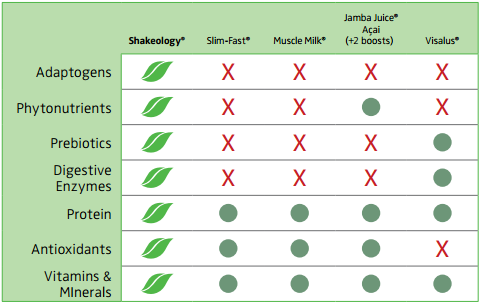 All Shakeology formulas have vitamins and minerals that come from the whole foods listed on the label. And why’s that important? Because Vitamins and minerals delivered through whole foods are more easily assimilated and recognized by the body than ones derived from isolates. The Tropical Strawberry and Chocolate Vegan Shakeology are dairy free, Lactose free and soy-free. They contain a new proprietary blend of plant-based proteins. It is ideal for those who cannot tolerate or wish to avoid whey protein or animal proteins, and those with intolerance’s to dairy and soy. Many people find that a vegan protein is more easily digested by the body than animal protein. The vegan formulas are not fortified with additional vitamin and mineral isolates (as the whey-based Shakeology formulas are). Therefore, for people looking for nutrition (vitamins and minerals) coming exclusively from whole foods, without fortification, the vegan Shakeology is a great option. 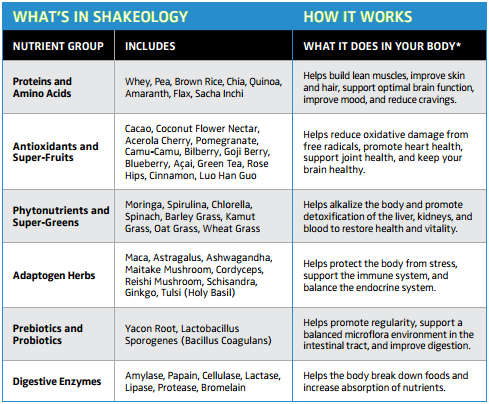 While other shakes on the market contain a few of the key nutrient groups, Shakeology is the only one that provides them all in one shake! Here’s the bottom line: If you want to live healthy, you’ve got to eat healthy—and Shakeology is the easiest and most affordable way. That’s because Shakeology is NUTRITION SIMPLIFIED. Shakeology costs just over $4 per serving for high-quality antioxidants, powerful vitamins and minerals, more than 70 superfoods, super-greens/phytonutrients, crucial proteins, essential amino acids, prebiotics, digestive enzymes, good carbs, and low fat. If you purchased each ingredient separately, it would cost more than $700. So while Shakeology might seem expensive at first, really there’s no way you can eat healthier and spend less. Many have tried; none have succeeded. That’s why Shakeology makes sense out of cents.